The regular Board of Commissioners meeting on Tuesday, February 24, was re-convened on Friday, February 27, to address certain items including the 2015 Budget. Commissioner Jeff Rader moved to add an item to the agenda, namely item number H8 for the purchase of the property. The motion was seconded, and the board voted in favor of adding the item. Commissioner Sharon Barnes of District 4 asked for clarification of some details of the purchase, including procedural requirements that could be addressed by the Legal Department. A motion was made to address Commissioner Barnes’s questions in an Executive Session, the motion was seconded and carried, and the Commissioners recessed for a closed Executive Session to address her concerns. The Commissioners returned from the Executive Session, a motion was made to come out of Executive Session, seconded and carried. Item H8 having already been moved and seconded, the Board of Commissioners then voted and the motion carried 6-0 with no abstentions. 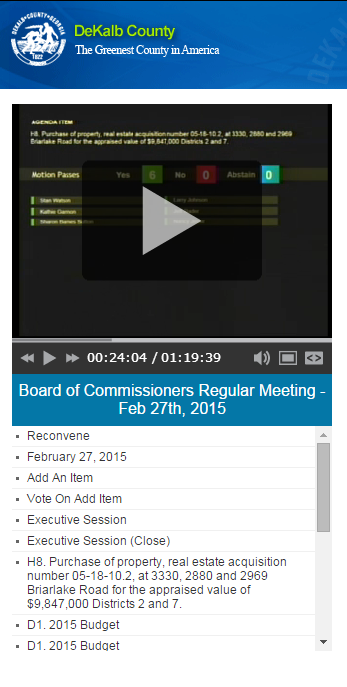 A video recording of the meeting can be viewed on the DCTV website. This entry was posted in News on February 28, 2015 by Laurie Marion. Red-shouldered hawks mate monogamously and remain in the same nesting area for their adult lives. Their territory tends to range around one to one-and-a-half square miles. They typically return to the same nesting site for several years in a row, and mating season will begin for them in a few weeks. The upshot of all this: the bird in the picture isn’t just passing through; he or she lives here along with a mate, and the area under consideration for development is part of his/her territory and nesting ground. 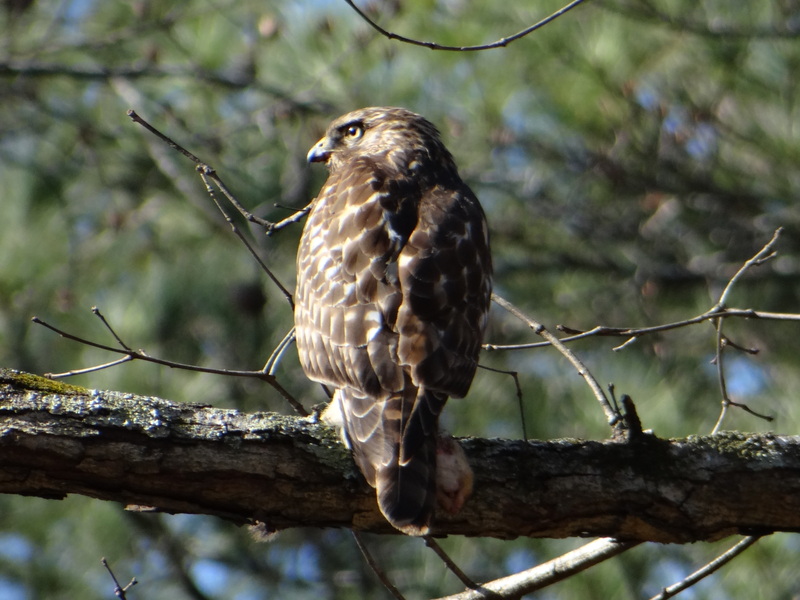 Red-shouldered hawks are a protected species in the city of Atlanta. Perhaps DeKalb County will someday offer the same sort of protection to avian residents of its urban forest. This entry was posted in Uncategorized on February 25, 2015 by Laurie Marion. Last night the DeKalb County Planning Commission voted to deny the sketch plat submitted by TPA-Arrowhead Real Estate Partners that proposed 43 lots for R-100 single-family detached residences on the Cathey property. Sketch plat review procedure allowed a total of five minutes each for comments from the developer or from the public. Speaking in support of the sketch plat, Attorney David Flint agreed with the Planning Department staff that changes needed to be made to the sketch plat to ensure compliance with Georgia stormwater management regulations. Briarlake Community Forest Alliance President Richard Marion enumerated several ways that the sketch plat did not comply with Federal, state and county regulations. Staff from the DeKalb County Department of Planning and Sustainability recommended a two-week delay to allow TPA-Arrowhead to revise the sketch plat. District 2 Planning Commissioner Jon West asked about flooding in the area of the Briarlake Forest. Tom Shillock, Certified Floodplain Manager from the Georgia Environmental Protection Division, explained the flooding situation in the Briarlake area. District 2 Planning Commissioner Jon West commented on the serious flooding and infrastructure issues in the area of the Briarlake Forest. After a few more questions to the Planning Department staff by several Planning Commissioners, District 2 Planning Commissioner Jon West made a few final comments. Planning Commissioner Jon West made a motion to deny the sketch plat, the motion was seconded, and the Planning Commission voted to deny the sketch plat. The audience responded with enthusiastic applause. This entry was posted in News on February 13, 2015 by Laurie Marion. The DeKalb County Planning Commission voted to deny the sketch plat submitted by TPA-Arrowhead Real Estate Partners. Details soon to follow. This entry was posted in News on February 12, 2015 by Laurie Marion. 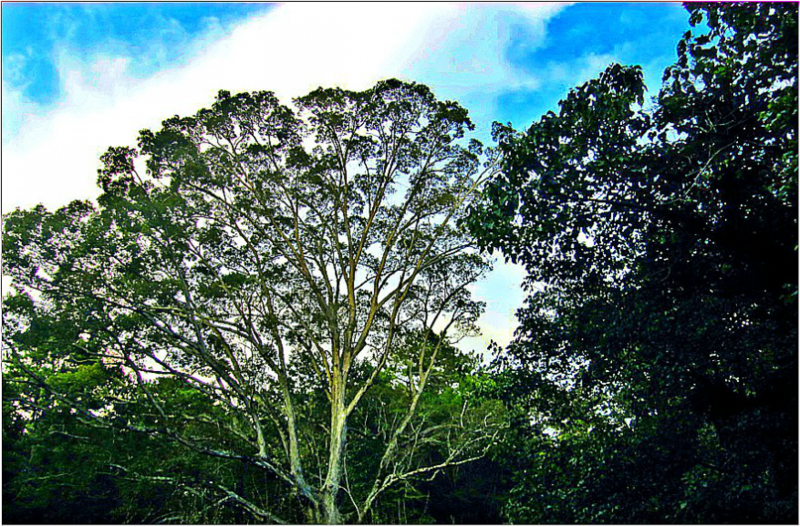 DeKalb residents effort to protect virgin forest. This entry was posted in News on February 11, 2015 by Laurie Marion. Neighbors concerned new development will harm land in DeKalb….